Please join us and hear first hand about our progress on the ground. 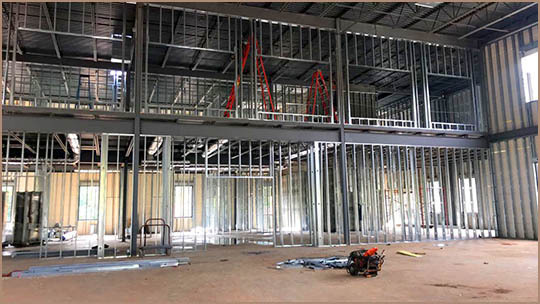 The photo above depicts the inner structure of the new Masjid building. We are setting an aggressive construction schedule and need to raise more funds. Your presence as our regular donor is cordially requested. We are also holding an Open House on Sunday, December 9, from 11am to 1pm, on the Masjid premises. Please join us for a personal tour of the new facility and delicious lunch catered by Biryani Pointe. As of November 28, we have spent $1,780,602.39 on the new structure. Our total banking balance stands at exactly $180,436.94. We need to raise more funds to continue the progress. We are getting very close to the finish line. For the latest progress report on the new structure and our financing, please visit Our Finances and Construction webpages, respectively. If you cannot attend, please click on the Donate Now button below and donate securely using PayPal online, discover how to participate in our regular Auto-Debit program or where to send donation checks. This opportunity may not last very long. We are together building a house of worship and a commnuity hub for this and many future generations of Muslims in Clarkston, Stone Mountain, Tucker, Lilburn, and other nearby cities. If you would like your email id removed from future Masjid communications, please reply to this email with the subject of "Unsubscribe" or click here.